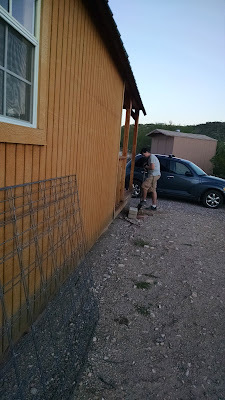 Finally, I got the two holes dug for the barn-shed tie downs. On Monday, I checked my nephew's grades like I do every day because the school emails them to me. I noticed two big zero's in English which brought his overall grade down to a D again. 69.5 to be exact. I fumed about them for a while since I was at work and could not do anything and then decided that the new rule for this quarter would be that any late work means manual labor as well as zero's. Last quarter, if he got the work in late then he escaped the hard labor but from now on, even if he turns it in and gets a half credit, he has to do work for me. I knew he had done the assignments which made it extra frustrating for me that he didn't turn them in on time. That kid is going to get stuck going to summer school even though he does the work. 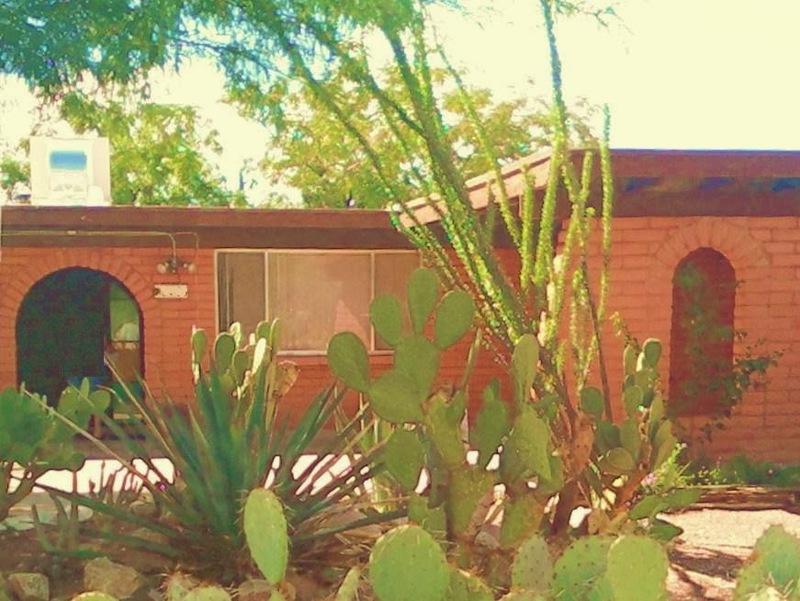 So, when I got home, I got out two pairs of gloves and two shovels and we each started digging holes. It was hard work even thought it had rained a couple of days earlier. After 12" it was pretty much impossible so we unwrapped the digging bar. I had heard that the digging bar makes digging in rocky soil easier but I had never used one. The internet was right. Digging bars are awesome for digging up rocks. 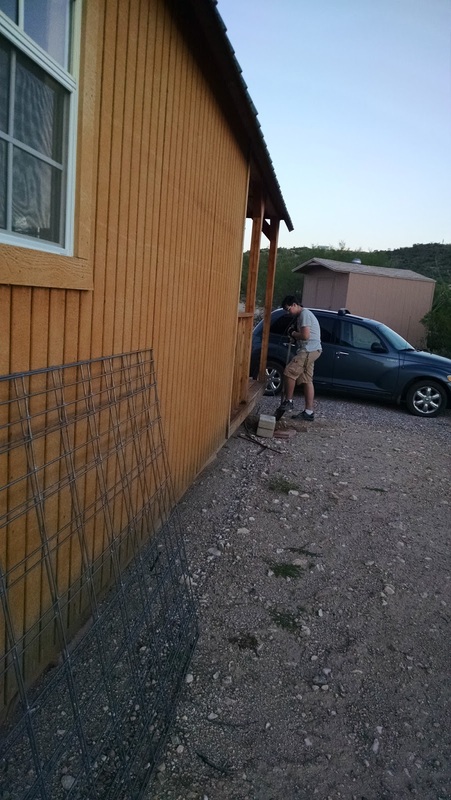 He used the bar to pry out the rocks and I finished scooping out the dirt. It was dark by the time we were finished and we had to use his cell phone for light. I was thrilled to get that chore done, well almost done. I tossed a tie-down anchor in each hole and we went inside for the night. The next day I had to work late so I didn't get home until after dark. This morning, I heard it raining and when I checked the holes they had some water in the bottom so I scooped some Quik-crete into the holes and mixed it with dirt. It rained again this afternoon. 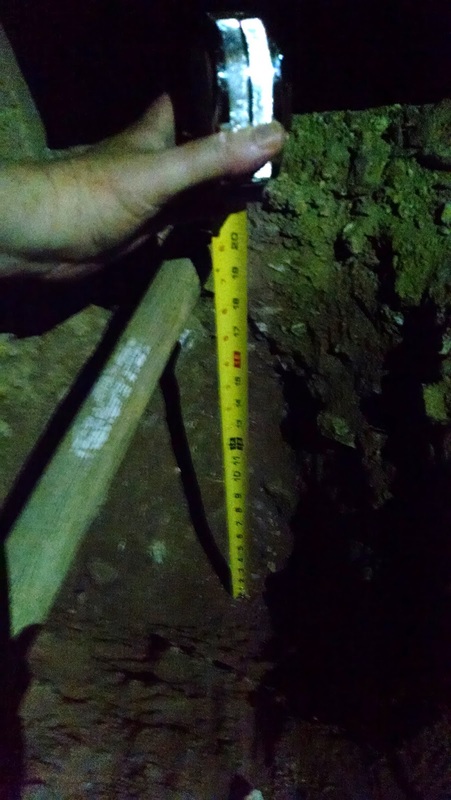 Now I need to wait for the soil to dry out and then call the geo-technical engineers to see if my tie-downs will pass the 400 pound requirement. I sure hope they do because I want to move on and do something else to the barn-shed, like, put skirting around it, build stairs, possibly even extend my fence so that it goes all the way from the mobile home to the barn-shed. In other news, my nephew's choir class is having a fundraiser for their spring trip to a Disneyland choir competition. They are selling super-expensive candles. I'm really not interested in candles. Doesn't anyone sell candy bars anymore? I suppose it could be worse. He could be selling magazine subscriptions. $17 and $28 for candles. I can't tell how big (or small) they are. Today at work, one of my co-workers sent me a picture of this koala and said that when I was having a bad day I should look at the koala and it would make me feel better because at least I wasn't as miserable as the koala. First off, as a biology major drop-out, I am very interested in animals so I had to look up koalas. This koala is in fact sleeping in the rain and not miserable. His fur is waterproof and koalas live outside in trees so it is normal for them to get rained on. They also sleep a lot to conserve energy. This koala is perfectly fine. But, being someone who cares for many animals, seeing an animal in perceived "need" does not make me feel better because I am better off than it. I want to help it. 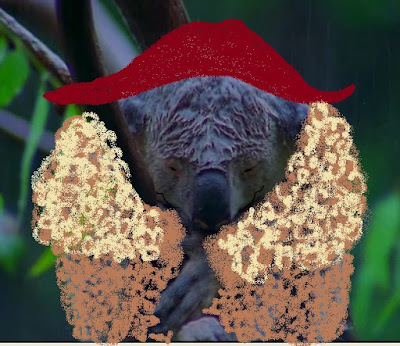 So, I gave the koala a coat and hat and sent it back to my coworker. kids need consistency and he hasnt had too much of that but you are doing a good job. My kids didnt suffer with all that child labour!! So funny about the Koala bear picture! Keep up the good work with your nephew. Sounds like he's learning to be responsible and have a good work ethic! If you aren't interested in the candle and would just be buying it out of obligation, just write a check for whatever amount you feel comfortable with. Donations are 100% profit for the choir and you aren't stuck with something you don't want. If each choir member has their own fundraising account, make sure it goes in his. I'm not sure how they are working the accounts so it might be individual accounts or just a gene real account. I'm a band director and have experience with the dreaded fundraising. Awww, the koala is now even more adorable! Candles, really? I guess it's the obesity thing or something but... eesh. I don't even believe in paying for fancy candles -- even when I didn't have a husband with asthma -- in general. I'm certainly not going to buy them at inflated prices. Just see if you can donate a few bucks. Welcome back, Lizzie! I hope you had a good holiday. I had plenty of chores growing up including ironing my dad's office clothes. I avoid ironing at all costs. I guess I did learn something after all, like, how to choose wrinkle free fabric. Michelle H, I guess it's all about perspective. 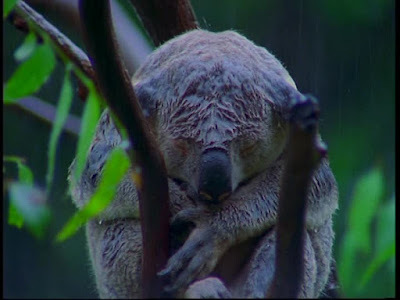 My coworker saw a 'dumb' koala in the rain, I just saw a koala being a koala. I keep bringing up colleges and careers with my nephew because he is missing a great opportunity for scholarships this year but some kids can't see that far ahead. It will be very interesting to see what he does with his life. thequiltingdoberman, I still remember the chocolate caramel bars. Mmmm....I think I won some extra prizes that year for selling so many boxes to myself. It was like, oops, I forgot my lunch...but I have chocolate bars in my locker! 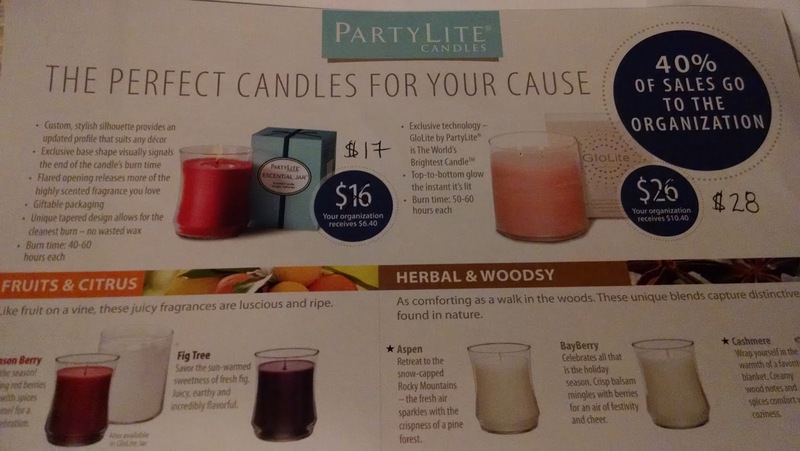 Abigail, I totally agree about just donating money instead of buying smelly candles. I still have candles from 15 years ago when I had money to burn (haha). Now I just think they are a fire hazard. Partylite candles are really high quality. However I too would prefer to just donate to the cause so that 100% goes to the cause. Susan, I agree. I also offered my nephew some paid tasks he could do to earn the money. I think that would be easier than selling for a percentage of the profits.